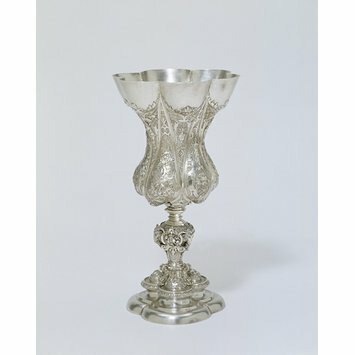 This cup once belonged to the Nuremburg Goldsmiths Corporation. It has been attributed to the workshop of Wenzel Jamnitzer. Apprentice goldsmiths applying for master-goldsmith status usually had to make a trial piece of work, or 'masterpiece', that met an agreed standard of workmanship. From 1531 until 1572 Nuremberg apprentices were required to make a columbine cup (named after its resemblance to the columbine flower), a gold ring set with a precious stone and a steel seal die. In some guilds apprentices or journeymen were not allowed to marry until their masterpieces had been accepted. Otherwise, they were subject to fines. If a masterpiece was refused, applicants could continue as journeymen working for other goldsmiths. They could also try to persuade a master to submit their work under his hallmark, although this defied guild regulations. The body in the form of 6 lobes in the upper part, tapering downwards, and alternating with 6 smaller lobes in the lower part tapering upwards, with repousse ornament of strapwork, flora, and figures of Diana, Lucretia, and Judith. Purchase - A. Pickert, Nuremberg (£150). 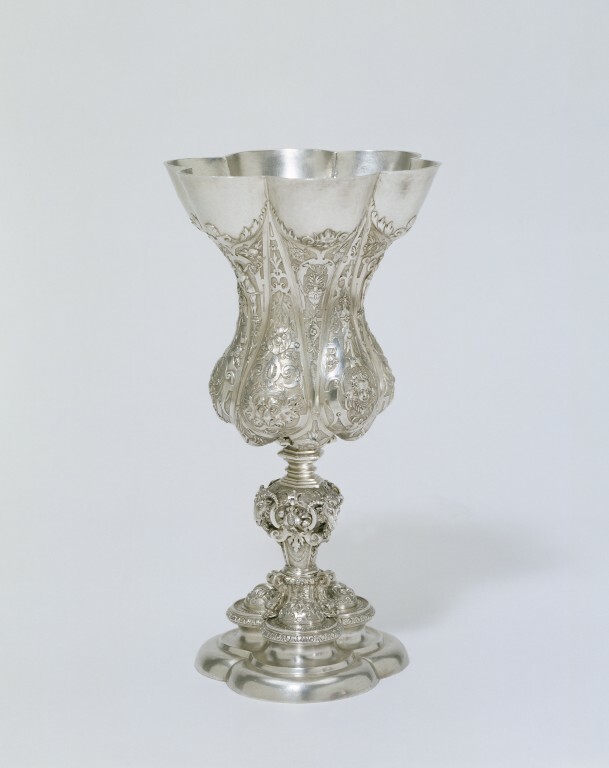 This cup belonged to the Nuremburg Goldsmiths Corporation until 1868. It was acquired in 1871 in Nuremburg by Henry Cole. Sir Wyatt report in register. Acquired with 614-1872 and 573-1872.